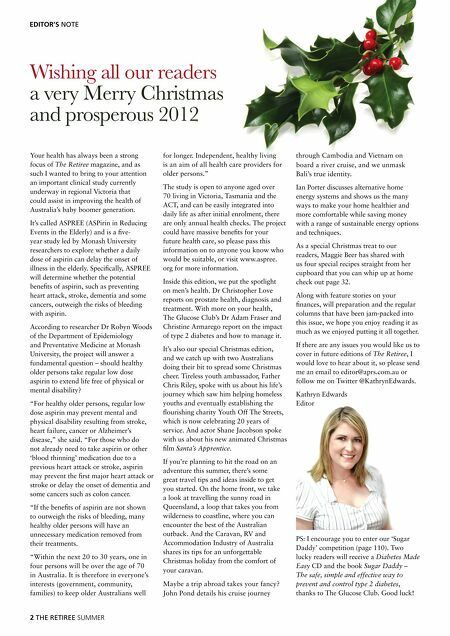 EDITOR'S NOTE Wishing all our readers a very Merry Christmas and prosperous 2012 Your health has always been a strong focus of The Retiree magazine, and as such I wanted to bring to your attention an important clinical study currently underway in regional Victoria that could assist in improving the health of Australia's baby boomer generation. It's called ASPREE (ASPirin in Reducing Events in the Elderly) and is a fi ve- year study led by Monash University researchers to explore whether a daily dose of aspirin can delay the onset of illness in the elderly. Specifi cally, ASPREE will determine whether the potential benefi ts of aspirin, such as preventing heart attack, stroke, dementia and some cancers, outweigh the risks of bleeding with aspirin. According to researcher Dr Robyn Woods of the Department of Epidemiology and Preventative Medicine at Monash University, the project will answer a fundamental question – should healthy older persons take regular low dose aspirin to extend life free of physical or mental disability? "For healthy older persons, regular low dose aspirin may prevent mental and physical disability resulting from stroke, heart failure, cancer or Alzheimer's disease," she said. "For those who do not already need to take aspirin or other 'blood thinning' medication due to a previous heart attack or stroke, aspirin may prevent the fi rst major heart attack or stroke or delay the onset of dementia and some cancers such as colon cancer. "If the benefi ts of aspirin are not shown to outweigh the risks of bleeding, many healthy older persons will have an unnecessary medication removed from their treatments. 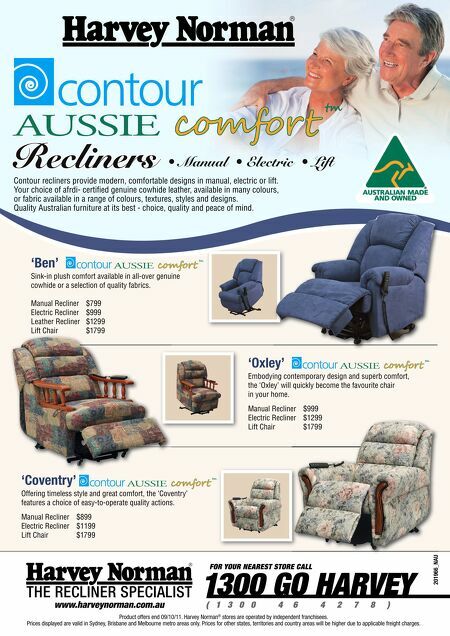 "Within the next 20 to 30 years, one in four persons will be over the age of 70 in Australia. It is therefore in everyone's interests (government, community, families) to keep older Australians well 2 THE RETIREE SUMMER for longer. Independent, healthy living is an aim of all health care providers for older persons." The study is open to anyone aged over 70 living in Victoria, Tasmania and the ACT, and can be easily integrated into daily life as after initial enrolment, there are only annual health checks. The project could have massive benefi ts for your future health care, so please pass this information on to anyone you know who would be suitable, or visit www.aspree. org for more information. Inside this edition, we put the spotlight on men's health. Dr Christopher Love reports on prostate health, diagnosis and treatment. With more on your health, The Glucose Club's Dr Adam Fraser and Christine Armarego report on the impact of type 2 diabetes and how to manage it. It's also our special Christmas edition, and we catch up with two Australians doing their bit to spread some Christmas cheer. Tireless youth ambassador, Father Chris Riley, spoke with us about his life's journey which saw him helping homeless youths and eventually establishing the fl ourishing charity Youth Off The Streets, which is now celebrating 20 years of service. And actor Shane Jacobson spoke with us about his new animated Christmas fi lm Santa's Apprentice. If you're planning to hit the road on an adventure this summer, there's some great travel tips and ideas inside to get you started. On the home front, we take a look at travelling the sunny road in Queensland, a loop that takes you from wilderness to coastline, where you can encounter the best of the Australian outback. And the Caravan, RV and Accommodation Industry of Australia shares its tips for an unforgettable Christmas holiday from the comfort of your caravan. Maybe a trip abroad takes your fancy? John Pond details his cruise journey through Cambodia and Vietnam on board a river cruise, and we unmask Bali's true identity. Ian Porter discusses alternative home energy systems and shows us the many ways to make your home healthier and more comfortable while saving money with a range of sustainable energy options and techniques. As a special Christmas treat to our readers, Maggie Beer has shared with us four special recipes straight from her cupboard that you can whip up at home check out page 32. Along with feature stories on your fi nances, will preparation and the regular columns that have been jam-packed into this issue, we hope you enjoy reading it as much as we enjoyed putting it all together. If there are any issues you would like us to cover in future editions of The Retiree, I would love to hear about it, so please send me an email to editor@aprs.com.au or follow me on Twitter @KathrynEdwards. Kathryn Edwards Editor PS: I encourage you to enter our 'Sugar Daddy' competition (page 110). Two lucky readers will receive a Diabetes Made Easy CD and the book Sugar Daddy – The safe, simple and effective way to prevent and control type 2 diabetes, thanks to The Glucose Club. Good luck!